The Fire Joker slot is the latest offering from Swedish casino games developer, Play’n GO. They are renowned for producing some the best UK slots. This lively slot offers a modern version of a traditional 3×3 slot game. If top notch graphics, superb animation and fun bonus opportunities tick all the right boxes for you. Then read on to discover why you should start playing this slot today. 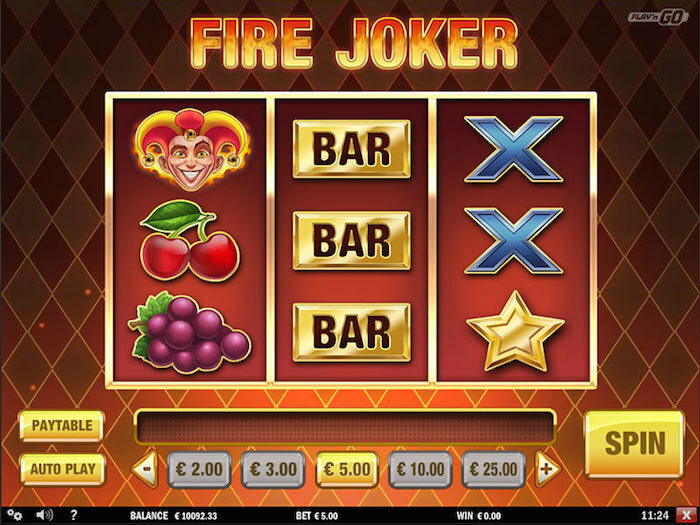 The Fire Joker Play N Go slot is a 3×3 game that offers a modern take on a traditional retro theme. At first glance, it might look like a relatively simple slot, but appearances can be deceptive. The good news is that it has a couple of extra features that helps heat things up. Both regarding play and potential winnings. Many of the symbols used are similar to classic slot machines. Lucky sevens, stars and the good old bar symbols feature too. Added to the combination though is a cheeky devilish joker. This acts as a wild symbol and will substitute for every single symbol in the game. There’s some funky sound to accompany your play. But with all the fire animation, we can’t help thinking that The Prodigy’s Firestarter song would be the perfect soundtrack! The graphics are clear and crisp and provide super impact when you hit a win. This will ignite the reels with red hot flames. The background is a diamond check design, in graduating shades of orange and red and there are sparks of fire floating around the screen – you certainly can’t miss that there’s a major fire theme going on with this slot! The animation is in high definition and the playability performance is excellent across all versions – tablets, mobiles and desktop PCs. You don’t lose out on image or sound quality when playing on smaller mobile devices. As one of the best slots by Play N Go, Fire Joker runs quickly and efficiently, and we experienced no stalling, timing out or interruptions while playing it. The reels feature nine different types of symbols – crosses, cherries, lemons, grapes, plums, bars, stars, lucky sevens and the wild jokers. Each symbol is clear, and you can’t miss the cheeky grin of the wild Joker! The joker has the bonus of substituting for every other symbol on the slots. When you start playing any new game, it’s always useful to look a the pay table, to find out what symbols and combinations to look out for. This isn’t a game with endless screens to scroll through on the paytable guide, or numerous combinations to take into account. As there are only five payout lines, it’s an easy combination to remember. When it comes to special features and bonus rounds, Fire Joker takes a more modest approach than some other online gaming slots. Three matching symbols on any payout line gives a win of varying degrees. If you have two reels with the same symbols, but not winning paylines, then you’ll get a second chance thanks to the Respin of Fire feature. If you strike it lucky and manage to achieve the same symbol across all three of the reels, then you’ll unlock access to the Wheel of Multipliers bonus feature. This spinning wheel offers you the chance to multiply your win – by up to 800x your bet! You only get one spin of the wheel, and it has 12 slots on it, featuring multipliers from x2 to x10. There are four x2 multipliers, three x3, two x4, two x5 and one x10 multiplier. The multiplier that the wheel stops on is then multiplied by the total of the bet win that triggered the feature. There might not be loads of bonus features to unlock, but the 800x multiplier potential helps make up for this. Betting on the Play n Go Fire Joker slot is easy. There’s a row of boxes on the bottom of the screen with all the betting options – choose from placing 5p right up to £100 per spin. Simply use the plus and minus signs to scroll along the options and select the level that feels right for you, then click the Spin button. Unlike some online slots, you can’t reduce the number of lines you’re playing across – but with only five playlines, you wouldn’t want to. The RTP (return to player) for the Fire Joker online slot is 96.15%. Fire Joker has been cleverly designed. It effectively spice up a standard 3×3 reel and transform it into an explosion of fire. It might not be the most involved or feature-packed slot, but it’s easy to play, quick to grasp and the two special features it does have help spice things up. If you fancy a hassle-free and uncomplicated play on an online slot, Play’n GO’s Fire Joker is the ideal choice for some red-hot sizzling fun.